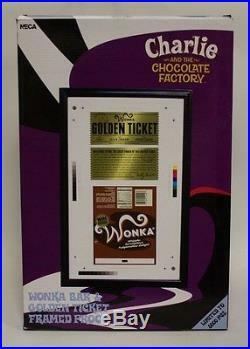 Charlie & the Chocolate Factory – Wonka Bar & Golden Ticket Framed Proof – NECA. Get your own Golden Ticket without having to eat all that candy! 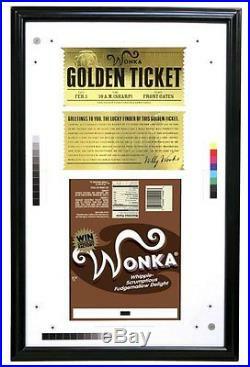 This framed proof features the front and back of the famous Golden Ticket and the Wonka Bar wrapper, precisely as they appeared in Tim Burton’s movie Charlie and the Chocolate Factory. The run was strictly limited to 2,000 pieces, and each is hand numbered on the piece and on the box. It’s professionally mounted in an 11×17 black frame, and while it won’t get you into the chocolate factory, you can hang it on your wall and tell your friends you went there. Packaging might show slight shelving damage. Package Dimensions (inches): 2x18x12. Prices are subject to change without notice. Great finds from our vault. Powered by SixBit’s eCommerce Solution. The item “Charlie & the Chocolate Factory Wonka Bar & Golden Ticket Framed Proof NECA” is in sale since Thursday, February 06, 2014. This item is in the category “Entertainment Memorabilia\Movie Memorabilia\Props\Reproductions”. The seller is “thenecastore” and is located in Hillside, New Jersey. This item can be shipped to United States, Canada, United Kingdom, Denmark, Romania, Slovakia, Bulgaria, Czech republic, Finland, Hungary, Latvia, Lithuania, Malta, Estonia, Australia, Greece, Portugal, Cyprus, Slovenia, Japan, China, Sweden, South Korea, Indonesia, Taiwan, South africa, Thailand, Belgium, France, Hong Kong, Ireland, Netherlands, Poland, Spain, Italy, Germany, Austria, Russian federation, Israel, Mexico, New Zealand, Philippines, Singapore, Switzerland, Norway, Saudi arabia, Ukraine, United arab emirates, Qatar, Kuwait, Bahrain, Croatia, Malaysia, Brazil, Chile, Colombia, Costa rica, Dominican republic, Panama, Trinidad and tobago, Guatemala, El salvador, Honduras, Jamaica.